It’s Backwards Day, so Judy Moody double-dares herself to become Queen of the Good Mood for one whole week. Can she do it? Will the real Judy Moody please stand up? In honor of Backwards Day, Judy Moody decides to turn that frown upside down, make lemonade out of lemons, and be nice to stinky little brothers. In fact, Judy becomes a NOT moody, cool-as-a-cucumber neat freak for one whole entire day. But when her combed hair, matching outfits, and good moods hang around for days after, her friends begin to worry. Could this smiley Judy be an impostor? Judy Moody: Mood Martian by Megan McDonald is the best novel yet. In this tale, I got to watch Judy Moody show a different side to herself than her usual self. In fact, her family started to think she wasn’t really Judy…at all. The change was pleasant and welcoming. Judy Moody is a young girl who has a wild imagination and a good heart. She wants to be good, but her plans always went wrong. There was always a big oops, somewhere if not everywhere she went. I was surprised by how much Judy changed and grew up. Her personality is still creative as ever. I laughed a lot. Her and Stink will always be my favorite two characters in this series. 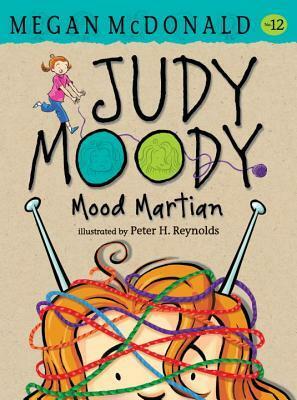 Judy Moody: Mood Martian is about Judy trying not to be her usual Moody self. Readers familiar with the series all know how moody Judy Moody can get at times. Her ways of accomplishing not being moody was interesting! I definitely recommend this book story to all. Judy did make a lot of boo boos as usual, but she somehow ended up at the top. I liked the themes and the new adventure presented. The illustrations were great. They went well with each chapter. Overall, I highly recommend this book to readers everywhere.